Do you use Paypal to accept funds? Do you live in the United States or otherwise have to pay taxes to the U.S. government? Then you should be aware of upcoming changes for Paypal and other payment processors resulting from the 2008 law IRS 6050W. In short, Paypal and those other processors might start tracking and reporting your income to the Internal Revenue Service (IRS). Not every Paypal user will be affected, and the first reports to the IRS will happen in early 2012 (covering your 2011 income). Here’s some background on the 2008 law leading to these changes and what they might mean for you and your business. You receive $20,000 or more during the year (gross payments, not net). You process at least 200 transactions. This would affect any users in the U.S. or those with businesses registered in the U.S. It would also include those living overseas if they’re still U.S. citizens and required to report their earnings. What if you have multiple Paypal accounts and they meet the requirements when combined, but not when counted separately? Paypal will still report your income to the IRS. So don’t think that using multiple accounts will get you around the reporting requirements. Who will not be Affected by the New Rules? If you are a citizen of another country and have absolutely no ties to the U.S. tax system, you shouldn’t be affected by the reporting change. Also, if you only meet one of the two requirements listed above, you will not be affected. Why is Information Reported Using a Form 1099? The 1099 form series from the IRS is used to report income earned as an independent contractor or in other miscellaneous non-wage ways. Paypal will use 1099 forms to report income received through their system if you meet the requirements. What Should You do if the New Rules Apply to You or Your Business? Start by reviewing the current year’s transactions to see if you meet the requirements. If you do, you’ll be asked to submit your identification number to Paypal for reporting purposes — your social security number (SSN), employer identification number (EIN), or taxpayer identification number (TIN). Don’t assume you can get around the reporting requirements by switching to a different payment processor. The law doesn’t only apply to Paypal. Any payment processor you use will be required to report your earnings if you meet the requirements. If you use a personal or premiere account with Paypal, you might also be required to upgrade to a business account if you meet the requirements. The account change is free. What are the Consequences if You Fail to Act? If you don’t give Paypal the requested identification number, your Paypal account might be limited until you do. If you use other payment processors, check with them to find out how long you have to comply and what will happen if you don’t. What Issues Might You Run Into? I’ll be affected by this change, and there are a couple of issues that come to mind — ones I haven’t seen adequately addressed elsewhere. Here’s some background so you’re aware of them as well. Business income and personal transactions are not separated in this payment processor reporting. And since all accounts are lumped together that could result in non-taxable money from personal transactions being reported as income. Every client in the U.S. who pays an independent contractor $600 or more is required to submit a 1099 for that income. If those clients process payments through Paypal and the contractor meets reporting requirements, Paypal will also report that money as income. In other words, the same income will be reported on two different 1099 forms. With double-reported income, that might make it appear a freelancer is earning significantly more than they actually are (and that they owe taxes on more income than they actually make). Find out today if the new rules might apply to you. Visit Paypal’s reports page (like the one below — my personal earnings information was blocked out) and review your monthly sales reports. There you can find out how much you’re earning in 2010, and how many sales transactions you process each month. In the end, you were always required to report your income, 1099 or not. So it shouldn’t affect you too greatly. But if you’re concerned about the potential reporting issues mentioned above, it’s strongly suggested that you speak to a financial services, legal, or tax professional for more personal advice. If you’d like a preview of the new 1099 form that will be used, you can visit the IRS website to view a draft of the 1099-k.
Disclaimer: Information in this article is for educational purposes only, and neither the author nor the website’s owner may be held responsible for any real or perceived damage caused by, or allegedly caused by, the information contained in this article. The author is not engaged in offering legal, financial, or other professional services or advice. If further information or more individual information is needed, it is suggested that the reader consult with a qualified tax professional. It seems it would be best to keep personal and business transactions separate when using any payment processing service. The requirement to report via 1099 for every business and contractor will be a big burden to small business owners. I agree, that’s usually best. My concern with this though is that both personal and business accounts are combined for IRS reporting. That means non-taxable personal transactions (such as under gift reporting limits) would be reported as income. More importantly, it means double or even triple reporting is possible. For example, let’s say I work with a U.S. client who pays me $5000 during the year. That client would submit a 1099 to report that income. Let’s also say they pay through my Paypal business account, where I total more than $20,000 in a year and have over 200 total payment transactions. Paypal would also report that same $5000 as income (double-reported). Now let’s say I also have a personal Paypal account, and $2500 of that is transferred to my personal account as payment from my business while the rest is left to cover business expenses. That $2500 will also be reported as income. That’s triple-reporting. And frankly I think taxes are complicated enough as it is for independent professionals. I worry that not only will this make life more difficult come tax time for many Paypal users, but I can’t help but think it’s going to confuse even the IRS when they’re auditing records. wow. I’m really glad I don’t live in the US. This all sounds impossibly complicated. Thank you for this important info,,any ideas of how the IRS might adjust auditing procejures because of these issues? ?,,also how can a taxpayer prove the exclusion of some of the reported income as you mention?? The best thing to do is to talk to a licensed tax professional. They should be able to give you tips on what records to keep in these kinds of situations. Since it hasn’t happened yet, no one can really speculate as to how it might affect audits and such, but I’d be surprised if similar things haven’t happened in other cases with double-reporting. A tax professional would know more about the history, how things were handled, and be qualified to give you actual advice. I can provide general information and commentary about the news aspect of it, but I’m not a tax professional and therefore will not give actual advice on these kinds of matters. Heylo guys, I currently reside in India and am not a citizen of Us. Will I need to report and pay Us taxes for services I charge for my clients who pay in dollars? Or would I have to report my earnings in India for income tax purposes only? I do not have a ssn, tin or ein. Do let me know thanks. These rules apply to those in the U.S. However, if you are in any position where you owe income taxes to the U.S. it might also apply to you. If you’re not sure, you should consult with a qualified tax professional. if I receive more than 20,000 in the year and have 200 transactions will paypal report to IRS even though I am not a citizen of US? If I have PayPal and also use Google’s payment processing system and take in $19,000 from each for the year. Is that a possibility, or do they have ties that would prevent this workaround? Looks like Larry from legitimate-home-business.com does not monitor this post, and that the information posted was to lure people to the legitimate-home-business.com website, to which I will not be visiting. Ok, so the info. was helpful, but to a very limited extent. If you’d like less “limited” information, please review the official documentation linked above. This article was a summary and detailing of two potential concerns to online business owners. For full details, you’ll need to get your information directly from the source, as that information can change over time. For example, it appears that now they clearly state personal payments won’t count toward your total. So they appear to have finally addressed that issue, as previously they clearly stated personal payments would be included in the total. OOPS! Larry is trying to lure people to his website by posting the website as part of his name. Jennifer Mattern is the individual who is no longer responding to comments. My mistake. Actually I did reply earlier. The comment was just stuck in the queue so it didn’t go live immediately [and since I don’t see it in the system now I can only imagine it was flagged and deleted as spam]. Just for the record the information requested was already in the article where I noted that all payment processors are bound by the same requirements, and it’s clarified in the official documentation the article linked to. Hi, I talked with Paypal in March when I finally read this ‘new’ reporting system. I asked them if one had several paypal accounts, would they combine them and she said no because right now they only have a name to link together not a SS# or EIN, but after 2012 they might ask everyone for that information and then they could be linked. Does that sound right? Also, does this apply to charge card merchants or retail merchants? If I charge over $20K/year on it will they report it to IRS? I’m actually getting out of the ebay business, I didn’t make that much but it was over 20K and it’s not worth having to do all the accounting, etc. If I need to make alittle extra I’ll use craigslist. I’d trust the documentation more than anything an individual says. And what they told you doesn’t even make sense. That’s because they will have an SS# or EIN for all accounts you have, and well before 2012. You were supposed to have given that already from what I understand — since tracking starts this year and not next year (2012 is only when reporting starts to the IRS, and that’s based on the info tracked in 2011). I noticed that they changed the documentation to say that personal payments wouldn’t be lumped with business transactions, but I haven’t seen anything saying they won’t tie different accounts together. And unless you find something official in writing confirming it, I’d have to say you should take that feedback you received with a grain of salt since it seems contradictory to what’s in writing. Also, I’m not sure what you mean about it not being worth it to do all the accounting. You have to do all of the accounting and pay taxes even if it’s less than $20k (legally). This is just a reporting requirement to make sure people aren’t trying to skirt the law and get out of paying their taxes due. I’m hardly a fan of taxes and have made my own fair share of mistakes over the years, but I think it’s completely reasonable for the IRS to make sure information is reported when so many people use services like Paypal to avoid a money trail through their traditional bank accounts. Using Craigslist won’t change that in the slightest. You would still have to accept payments in some way, and you would still have to report that income. This is baffling to me because i need help/advise. I just heard about it today because my cousin who uses my account just told me that paypal is asking for EIN. Apparently, she had known for a while but never thought she would be making more than $20,000 on the services she form for her clients. Three years ago, when he was still trying to make ends meet on Ebay, she ran into trouble when someone bought a merchandise and charged back on cc. She did all she could but her paypal account was not restored. Hi- I have casually been selling things on ebay of years but NEVER sold $20,000 or 200 transactions in a year. Paypal has asked for the information a few times but since i do not meet the “2 requirements” i have not provided this information. I’ve since (last week) stopped selling on eBay because I do not know, even if I do not meet such 2 requirements, if paypal will hold my money!? Like I said, been selling only as a hobby and just for play money and never make enuf to even try to do it full time or even consider making more. I know many do use paypal as a venue for sales and buying, and that’s fine for a bonfide business but why is paypal bugging me? I called them and they said not all are involved in needing to give the information and yet everyone was given the email to give their EIN or SS# to paypal. Makes no sense. They still wanted mine (via word) even tho I do not meet the 2 requirements. THAT bothered me big time. So in frustration, I’ll donate all the things I was going to sell, keep a few and write off the values on these things. It’s very discouraging…. OK first off not selling on ebay. But I use PP to receive payments from people in groups I belong to. I buy items and if they don’t work for me re-sell them to others. I use PP because it’s fast and it allows people from anywhere to buy or sell to me. I am not a business. This is strictly a hobby deal. But because I arranged some Group Orders to companies over seas to save on shipping even get free I feel I am being punished. To me I am just taking X$ to buy something then re-sell it never at a profit, always less then I paid or if lucky I break even. I gave PP my SS#, I downloaded now 4 months of my statements as well as took the time to copy and paste the first 5 months of 2011. All because I thought this rule would not effect me. But I am guessing since they want not just amounts of what I sold, but also went I spent. Not Fair! If you receive money through Paypal because you’re selling something, then you might be subject to the rules. From what I’ve seen it has nothing to do with how much you spend. Revenue is only related to the amount you earn — those incoming payments. It’s also important to note that Paypal themselves isn’t taxing anyone. They’re simply reporting the revenue to the IRS. The IRS lets you know how much you owe, and you pay it directly to them. Paypal just sends them a form. OK Just want to clarify. I keep seeing the word Revenue like it’s money I get through PP not money I spend. So if it’s only money I get I am I think OK, but if it’s both that would be a terribel thing as then wouldn’t they tax me and the person I buy from? If i dont withdraw money form paypal to bank account will paypal report to IRS ? They report your income paid through the service; not what you withdraw. So yes, it would be reported. Paypal also does what they call “Payment Holds” for 21 days until your item is shipped and then it is released back into your account. I guess my main questions would be if when those “payment releases” are taken off “Hold” and the Net amount put back in my account 21 days later, is that amount added to the $20,000 as well? That would almost be doubling the amount of one transaction. $20 now became $39 minus Paypal fees. So for example, the gross amount was put in my account initially, then taken out to be put on hold and then the Net put back into my account 21 days later, however the Net shows up in the gross column as well. It’s really frustrating when you’re trying to figure out the amounts for the year, so how do you know whether to add it towards the gross or not? What’s more confusing is that in the “Monthly Financial Summary Report”, the payment releases show up in the credit column. Is the release amount just there for reference? Do I go by my “Payments Received” for the gross amount and nothing else? Also, does the monthly cash back from using your Paypal card add in to the equation? That shouldn’t be an issue. A hold should be tied to the primary transaction — kind of like multiple parts of the same sale. It’s more about tracking where the money is during the transfer and to the best of my knowledge it shouldn’t be counted as additional revenue. It should be counted either when a sale is made or when money is finally deposited into the account — not both. I don’t know which of those things they go by though, so I’d suggest speaking with a Paypal rep about it to discuss the types of transactions you engage in for your specific case. The hold and the actual transfer are two parts of the same transaction. Holds should eventually be released. On the outgoing side of things I’ve had some problems in the past where a hold was taken, then the charge actually processed, and the hold wasn’t released (taking things out of the account twice). This only happened with debit card use tied to the account, and happened rarely. If you’re seeing two active things affecting your balance for the same transaction, you should give them a call. They’ve always been able to check and fix the issue promptly for me. You might be seeing something similar. I don’t see why a deposit from your linked bank account would be counted as revenue. Their site specifically says this only applies to the sale of goods or services, which a bank transfer from your own account wouldn’t be. Thank you again Jennifer. You are very helpful. I’ll give them a call just to make sure that’s not happening to me. As for the bank transfers, I only ask because in the Monthly Financial report, the money going into the Paypal account from the bank is on the credit side of the statement which made me believe that may be taken into account. If you go to filter by Payments Received, which is what should be what is reported as income by Paypal, it does not include Bank Transfers as this is not a “Payment Received”, it is a transfer of funds between your personal bank accounts. So it should not be included on any 1099 form, as you are not paying yourself. However, you can also make payments through Paypal from your bank account without ever transferring the funds first, so then it is just a straight payment. As for personal payments, “Gifts” are also taxable per IRS regulations and there is a place to report them on your tax forms, so if you are being Gifted any significant amount over the course of the year, it is best not to take the chance of not reporting, especially if you are also receiving a 1099 already from Paypal that links that account for IRS review if you are a lucky one chosen for audit. Personal income is not exempt, it is just reported differently. If I have PayPal and also use Google’s payment processing system and take in $17000 in Paypal and $4000 in Google trough the year. Is that a possibility, or do they have ties that would prevent this workaround? I’m sorry, but I cannot give anyone information in an effort to “work around” this reporting, as that is admittedly an attempt to circumvent the law (your taxes should be reported by you whether or not a payment processor also submits documentation). You’ll need to make those kind of ethical and business decisions independently. Jennifer Mattern, the IRS has no lawful right to take income tax from the American people. They are criminal frauds. Do your homework. I don’t know yet if there is a way to work around this issue, for those of us who rightfully stand against having to pay income tax. Perhaps dealing in cash is the only way.. unfortunately cash is becoming obsolete. We have to collectively stand up to these guys or they are going to intimidate us into a fascist state. If everyone buckles their knees and gives in to this, we are inviting the state of nazi germany into america, and i am not kidding. did you know fema has been building concentration camps on American soil? we are becoming less and less free all the time – stop pretending like this is all okay – look at what is happening – do your homework, find out the truth, it is very important! You’re entitled to your opinion ceasar, but your comment is completely outside the scope of this article. We’re not interested in politics and whether or not people like the income tax system or feel like they should have to abide by it. This article deals exclusively with payment processor reporting requirements, and we will not do or say anything to encourage people to circumvent current laws. I currently reside and live in Peru and am not a citizen of Us.My paypal account is peruvian Will I need to report and pay Us taxes for services? I do not have a ssn, tin or ein. I’m sorry, but anything about your individual account will need to be taken up with Paypal directly. If you’ve contacted them, they would have been the best people to give you accurate information based on the details of your account and how it’s used. I just start selling some not going to use stuff on ebay on OCT 2011. and I found that who selling more then 200 translation and make $20,000 will be report their TAX. but what if I didn’t make $20,000 in 2011 but sell more then 200 translation? am I have to report tax too? all stuff are usually under $20 for each translation and if i will pay tax for those garbage sale will = nothing @@? well.. pleas help me this question. thank you. If you live in the US, you have to pay taxes on that amount even if Paypal isn’t required to report the income. You still are required to report it yourself. If you live elsewhere, you have to abide by your own country’s tax laws. Unless you meet both requirements mentioned ($20,000 and 200 transactions) Paypal isn’t required to report anything on their end. Actually, that is not accurate. Personal payments DO count toward the 20K/200 payment limits. Bank transfers (as in transferring from your bank into your Pay Pal account) do not, obviously, as that would be like transferring money between bank accounts. However, personal payments DO count, payments for shipping DO count. Any time a dollar is going into your account from another individual or business, it counts toward the 20K and each single payment counts toward the 200 mark. Further, be aware of this, REFUNDS are tricky here, too. Let’s say I make a $500 sale, but there was some mistake where the buyer was overcharged or changed the order. I refund the $500 and the buyer sends me $400 back. That counts as $900 toward the 20K limit, since you received $900, even though you refunded $500. Pretty stupid but I was told that this is the case. I’m sorry Ricky, but that is incorrect. Personal payments are not included. Please review the official documentation from Paypal linked in the article above. They address this issue directly, noting that only payments for the sale of goods and services count. They also go on to outright say that personal payments are not factored in. You are, however, right about refunds. That’s a part of net figures whereas they’re required to report gross payments received. I agree that’s pretty stupid, and hopefully it will change in the future. you have been very helpful jennife, but only at translating paypals details. there is the info and then the truth. search around the net they are stating a lot and are absolutely lying about it all. for an example, a friend did not hit neither of the 20/200 and the sent a form. another was emailed and told he was approaching the threshold and immediately stopped that second. they still sent one. they told him it was due to personal tranfers that they clearly state are not included. how is there not going to be a class act against the way they are handling this, i have no idea. if they would do as they say and not lie, it would be different but the have lied to everyone. and thousands if not millions will pay. i understand why. i understand the laws and why. but someone making 20k a year….. probably still in poverty. I am now having a situation. Currently I am selling things on eBay with the PayPal account that I’ve made when I was an exchange student 10 years ago. I am from Japan, not a citizen of the US as well, and I don’t stay in the US anymore. Last year on my eBay, my sale was over $20,000 and I just received from the IRS that I have to pay taxes, and needed to provide tax ID number (Social Security Number (SSN), Employer Identification Number (EIN), or Individual Tax Identification Number (ITIN) to them. Unfortunately, I don’t know or don’t have any of them above. What should I do now? Now they send the letter to my old apartment in the US where I don’t live there anymore. Pleae help..
You shouldn’t have been operating a business using an incorrect U.S. address then. It sounds like you’ll need to take your issues to a qualified tax lawyer in your current country to figure it out. You’ll also need to take it up with Paypal / eBay, since you were using a false address with them last year. Yes. Of course it’s income. Your expenses are irrelevant. That only matters when calculating profit (income / revenue minus expenses). The new year end summary feature paypal now has only shows 2011. Does anyone have a link/article that shows the best way to get the essentials #’s for 2010? I just want to be in the clear in the event the IRS are going back to 2010. I pulled the 2010 “history” report for the entire year but between the pmts received / refunds / cancelled fees/ charge back reimbursement etc (many more) – how would one collect this information accurately? This is an extremly difficult document to understand – no wonder so many people gave up on ebay book keeping. Kudo’s to paypal for the changes in viewable records for 2011 but anything available for 2010? and does anyone know if they will audit 2010? I registered my paypal account in the US when I was studying in Boston a while back and still continue to keep that account since I moved back to hong kong. I am not a US citizen , do have a ssn, but haven’t lived in the US since 2010. but this year actually i got the tax form 1099k from paypal. What am I supposed to do? I kept the paypal account because I have US bank account. Now I am confuse what I am suppose to do. I don’t even how to file tax or if I need to pay tax to the IRS. I received a PayPal 1099-K for an account I opened (Premier) for a motorcycle club I belong to. The 1099-K form shows my name as the as the PAYEE but the It has the Club EIN number in the PAYEE’S TAX ID section. Do I report this on my income tax return / SSN or does the club file a separate return for the 1099-K amounts? Or should I get PayPal to change the PAYEE Name to the Motorcycle Club Name? Is the 20,000/200 threshold for each payment processor or is it for all payment processors. I would venture to guess it is for each payment processor because Google checkout would not have records for Paypal transactions and vice versa. Unless a merger would happen or if one payment processor was actually owned by another payment processor their would be no way for them to dig up another companies records. I hope this answers the many people on here who asked this question. If you Jennifer Mattern know the answer could you please post it? And Jennifer, to respond to your assertion that giving that information somehow makes you an accomplice in tax fraud is just hooey! Information is just that information, it is up to the recipient to decide how to use that information. No one is asking you how to skirt paying taxes, we are just asking if the reporting is done based on a 20,000/200 threshold at each company or at all companies combined. 1) Yes, it’s for each payment processor. 2) Yes, that’s exactly what the previous commenter was asking about. They didn’t simply ask what you did. They blatantly asked for a “workaround” that would get them out of having their income reported. And I didn’t say anything about being an “accomplice in tax fraud.” Do not put words in my mouth. Whether or not I would be legally liable is irrelevant. I won’t betray my own ethical standards by helping someone get around the law, which is exactly what they asked about — whether or not splitting payments would enable them to do that. Does the IRS use computers to check that individuals are reporting their 1099-K deposits against the info they received from paymt processors? What happens if the 1099-K deposits are inadvertently unreported? That will probably vary depending on the individual. Their system would likely reflect that they received a 1099 for you, based on the TIN you provide on your tax return (your SSN or EIN). But I can’t be sure if the computer system automatically flags it if you report much less than your 1099 shows and you automatically get a letter about it, or if a red flag in the system triggers a manual review so a person can look more closely. If they couldn’t check, they would require the 1099-K though. That’s the point of them — to make sure people are reporting that kind of income. Remember, the payment processors send the 1099-K directly to the IRS, so they’ll know what was reported whether or not you include it on your return. Hi, if I only sold 4 items on ebay, and had all of my money transactions through Paypal which totals my profit to 20 dollars, do I still have to claim this as income? All four transactions took place December (2011), January and February (2012) and I also haven’t withdrawn any of the money yet to my bank account. I know your article said that it has to meet the two requirements of 200 transactions and over 20000 in profit, and on my PayPal account it shows that there are no tax documents for my account, but I wanted to make sure I’m not breaking the rules! Thanks. First, you should realize that “no tax documents” from Paypal has nothing to do with whether or not you have to declare your income on your taxes (nor does withdrawing it to a bank account). You need to do that whether you meet those requirements or not. If it’s taxable income, it’s supposed to be reported, no matter how small the amount. That’s true even if you didn’t earn enough that the client or payment processor is required to file form 1099 to report the income for you. You should have your own records. If this is the only self employment / miscellaneous income you have, you wouldn’t have to pay self employment tax on it because it’s less than $400 for 2011. But it would still be counted toward your overall income for income tax purposes. why US want to doble charge me ? becouse my client pay me. using Pay Pal service? i have absolutely no ties to US tax sistem!! The only people who can help you with your personal situation are tax professionals. You should consult with one. In general, you shouldn’t be double-taxed. But you’ll need a tax professional to help you determine the tax agreements the US might have with the country you’re living in. That will determine how much you’re taxed in total and how much gets paid to each country (if you end up owing there or not). No. Please review the information already posted and the link given to Paypal’s official details. As we’ve discussed before, only payments for goods and services apply — not transfers from your own bank account. But remember. Just because Paypal doesn’t submit a 1099 for you, it doesn’t mean you don’t have to report the income. If I dont provide an SSN/ITIN, Paypal will prevent me to withdrawn the money on the account? Or they will just limit the account to prevent more funds to be charged to it? Thanks. What about if you give someone a “Donation” by clicking on that special button they have posted to “support their server costs for free youtube informational videos” This website isn’t a Non-Profit, It’s obviously a person looking to collect some cash for their knowledge of how to fix some programming problems. If they go over the 200/20K PayPal rule, will they be reported to the IRS? Your server expenses are not a “cause.” So any income would be business income, and they should be reporting that. Whether they do or not, the site owner should be reporting that income once they hit $600. I just saw one person’s story where Paypal actually told them they had to refund the “donations” they’d received because they weren’t a charity and weren’t authorized to fundraise on behalf of a legitimate charity. They eventually backed down about the “wrong button” being used due to public heat in that case. But based on what I’m seeing on the site, your example still wouldn’t fly. You’d want to use a typical buy-now style link instead of a donate button (kind of like the “buy me a beer” links at the end of some blog posts). In the end, income is income and it should be reported. If you’re unsure about your personal use of the donate button, your best bet is to ask a Paypal rep to review it for you. where in paypal can I find the total number of payments I have received? Cant seem to find that easily or do i need to count up each transaction from monthly reports? The last time I checked I had to look at my monthly reports and count things up. It’s a pain. But on the other hand, I can understand Paypal not wanting to put too much emphasis on it. Doing that might give some folks the idea to just stop using Paypal when they get near the reporting limit. Anyone in that group is likely trying to hide their income from reporting (not good), and it’s not in Paypal’s business interest to do anything that might encourage people to stop using their service. That said, it would be good to know just for the sake of evaluating your own business. And it’s possible that there’s an easier way to do this. I just haven’t found it yet. Do canceled payments on your paypal count against your 20,000 threshold? That might depend on what you mean by cancelled. If it was cancelled before an actual payment was processed, I don’t see how it could count. If you received the payment and it was reversed in a refund, it does still count. That’s because they look at gross payments (before those adjustments) rather than net payments. In this case, however, if you are reporting this as business income under the independent business section of your taxes (which is where I would report the 1099 income at this level), there is a section that allows you to report refunds and/or discounts given and that amount is then subtracted from the income. However, if ou are claiming any significant amount, you best have the documentation to back it up. Will PayPal also report for previous years in which those conditions were met? Or will hte IRS want to look into previous years? I know this article is years old, but I have to comment. There seems to be so many people that don’t understand business, and taxes, at all. It also sounds like a lot of people could be opening up themselves to audits. Take for example the person who says they buy from Amazon & Walmart, and resell on eBay. 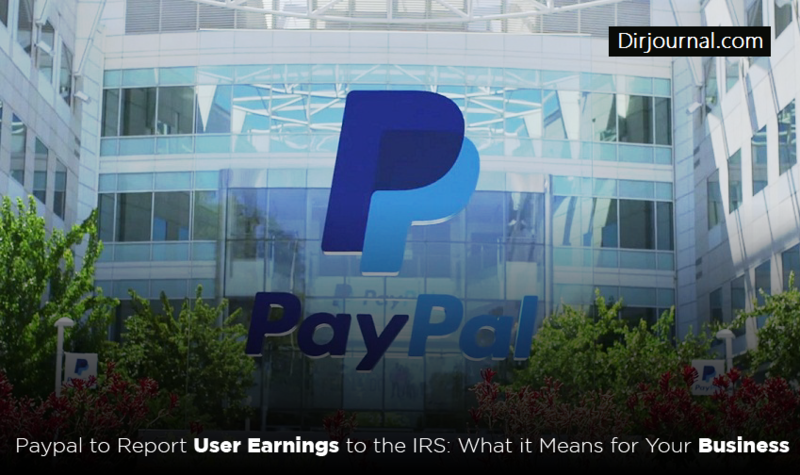 If the first year that reporting was required, you all-of-a-sudden have $105,000 in income reported from Paypal, wouldn’t you think the IRS might want to look & see if perhaps this source of income may have been unreported in the years prior? If you are buying & selling on eBay, then you should have been filing all along. I agree it gets to a point where maybe having to hire an accountant makes it not so much fun. But anyone who is selling $20,000 & 200 transactions per year, is in a business. This website is so helpful, but no one addressed my case. My wife and I report 1040 as a married filing jointly. My wife has her own business and I do too. We of course have the different paypal accounts. The income from each of us doesn’t meet the 20k/200 but combined amount does. Do we need to report it when filing 1040?